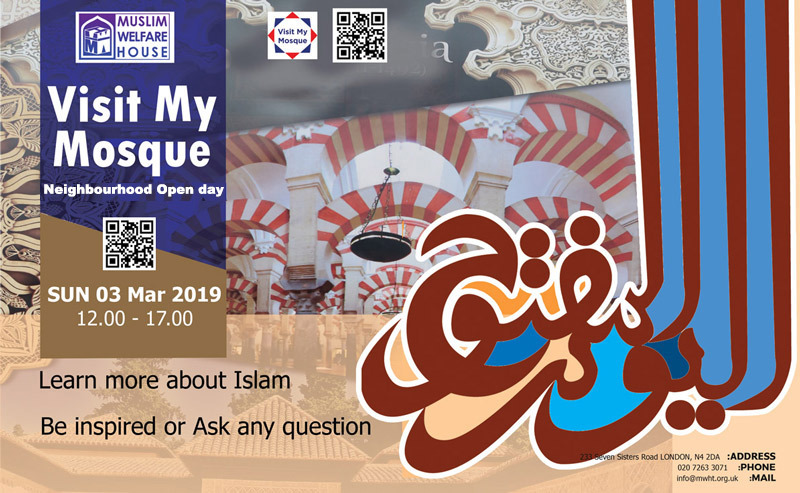 Visit My Mosque day is a national initiative facilitated by the Muslim Council of Britain (MCB) encouraging 200 mosques across the UK to hold open days to welcome in their neighbours from all faiths and none and building bridges across communities. This year #VisitMyMosque will be taking place on 3 March 2019 – check out the promo video and get involved today! At the end of the day, we offered visitors a tour inside and had an interfaith discussion with questions and answers asked by the local public. We also had henna hand painting, try a hijab, traditional clothing and homemade food cooked by volunteer sisters and writting names in Arabic Calligraphy. We had RH Mr. Jeremy Corbyn, leader of the Labour Party visit and sit down with the community, CEO of Muslim Welfare House Toufik Kacimi, was happy at the day’s success as we had much feedback from our visitors who said they loved the experience!